Kristen is a former copywriter for Crutchfield. She wrote copy for both the web and catalog, covering a variety of home A/V products that included speakers, camcorders, and Blu-ray players. She also wrote a number articles and blog posts for the Crutchfield Know Zone. Editor's Note: Thanks for visiting Crutchfield. This popular article has been superseded by two new ones. 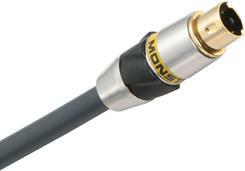 To see up-to-date information, please read our audio cables buying guide and our HDMI cables buying guide. So you've just bought a high-definition home theater system. You get it home, plug it in with the included cables, and you're set, right? Not so fast. If you're using poor-quality cables, like the ones that come in the box with most audio/video gear, you could be throttling your system's performance. Think of it this way: if you owned a high-performance sports car, you wouldn't outfit it with low-end tires — you'd get insufficient traction, poor handling, and increased road noise. You'd lose all the benefits of buying a high-performance car in the first place. In the same way, low-quality cables can rob you of the performance you paid for when you bought your system. Poorly made cables can allow noise and interference to compromise the signals coming from your source components, resulting in a subpar listening or viewing experience. They generally won't give you the best-quality connection, and often aren't built to last. And of course some free cables may simply be too long or too short for your setup, making them less than ideal. Replacing free "in-the-box" cables with higher-quality ones, or buying a step or two up from the cheapest quality cable you can find, can really make a difference when you're building a nice audio/video system. You'll enjoy more realistic sound and a clearer picture when your system isn't hampered by weak links. So in this article, we'll give you the information you need to choose the right type of connection for the job, and to find a good, high-quality cable. What will you be using your cable for? Finding a cable with all the capabilities that you need, and not one with more features than you'll use, can really help you optimize your system without breaking your budget. Before choosing a cable, you should ask yourself three questions. Using high-quality connections between your high-end gear will help you get the most out of your components. » What kind of signal will it need to carry? If you're hooking up an old VCR, then it's okay to opt for a lower-quality connection. But if you're connecting a high-def cable box to your HDTV, then you'll want to go with an HD-capable cable, like HDMI. See our separate discussions on audio and video connections for tips. » What length do you need? Measure the distances between your components to make sure your cables are long enough, especially if your components are shelved in such a way that the rear panels are difficult to access. There should be enough slack to let you pull the component forward and reach the rear panel. However, try to avoid long cable runs, if possible, since it'll lead to more signal degradation. If you're planning to install your cables in your walls, make sure any wire you're putting behind a wall is UL-rated for that purpose. In most cases you'll need a cable labeled CL2 or CL3 — Underwriters Laboratories (UL) certification means the cable meets safety standards for in-wall installation. Also note that build-quality is especially important here — if you're installing in-wall wire, you don't want to go through the trouble and expense of replacing it in a few years time. 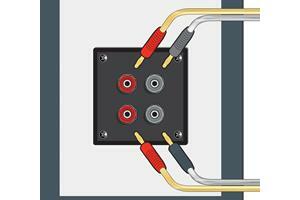 See our guide to in-wall wiring for more helpful information. 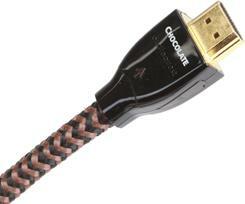 Choosing the right type of cable is important for better sound and picture quality. Will you be able to see and hear a difference? It depends. If you have a good- to high-quality system and you know its performance well, then the improvement should be clear. If you're not that familiar with your system yet, then cable upgrades may be more subtle. But if you've ever had to jiggle a loose cable connection to get the picture back on your TV screen, then you already know that having a well-crafted cable with a tight connection and well soldered plugs can really make a difference in the cable's performance. And of course, your cable is only as good as the components you're working with, as well as the type of connection you're making. For example, even a high-quality composite video cable can't produce a high-definition picture like an HDMI cable can. And even a high-quality HDMI cable can't fix a fuzzy picture if the culprit is a poor signal from your satellite box. The best it can do is carry that signal faithfully. So remember that it's really all about making every link in the audio and video chain strong. 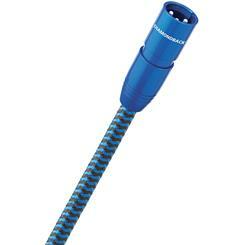 The outer jacket protects the inner materials of the cable from damage. The shielding material prevents radio frequency interference (RFI) and electromagnetic interference (EMI) from reaching the conductor and causing noise. Shielding also limits any noise radiated from the cable. It's frequently composed of multiple layers, like the braid and foil layers pictured above. Stereo RCA connectors are some of the most recognized types of connectors, although there are many different kinds. The dielectric is an insulating material between the conductor and the shielding material that helps protect the signal. The conductor is the wire — the part of the cable that actually carries the signal. And finally, the connector is the part of the cable that plugs into your gear. The type of connector varies depending on the type and quality of your components. 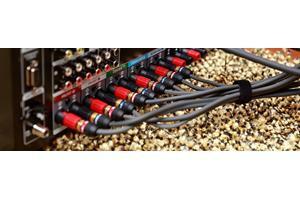 Below we'll explore what factors you should consider when choosing audio and video cables. cables that use an oxygen-free copper (OFC) center conductor — it's more likely to pass signals accurately, with minimal signal loss. the best shielding you can afford to combat interference. Cables that include two separate shields — one made of braided copper, to guard against RFI, and one made of foil, to guard against EMI — help keep annoying buzz or hum from polluting the signal. good connectors that provide constant, high-pressure contact with your components' jacks. If the cable you're considering uses metal connectors, look for gold-plating to prevent corrosion and maintain reliable, high-quality signal transfer. These connections should be your first choice when it comes to audio. They typically provide the best sound quality, including the ability to carry a full surround sound signal. Below, we've listed the three main types of digital audio connections. 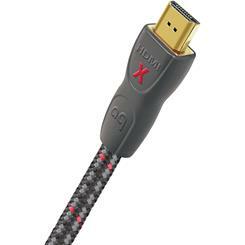 A high-quality HDMI cable will let you enjoy high-resolution audio from your Blu-ray player. What it does: HDMI (High-Definition Multimedia Interface) can deliver the highest-quality picture and sound available, and all that information is carried over a single cable. It uses a 19-pin connector to transfer digital audio and video signals between components, eliminating the compromised sound quality caused by digital-to-analog conversions and re-conversions. This surround-sound-capable cable is the only one that supports up to 8 channels of super-high-quality "lossless" soundtracks, including all the latest high-resolution audio formats from Blu-ray, like Dolby® TrueHD and DTS HD™ Master Audio. When to use it: Whenever you're hooking up a high-definition source — like a Blu-ray player, high-def cable or satellite TV box, or high-def gaming console — to your home theater receiver. What to look for: The tolerances for HDMI cables are incredibly tight: the length of each strand of wire must be within 1/20,000th of an inch to ensure it will work properly. Different cables use different materials and construction techniques, and it's important to find a certified HDMI cable that'll carry the signal faithfully. Remember that HDMI has gone through some changes over the past few years, including changes to the audio specs. Make sure that your cable meets the correct HDMI standard of the gear you're trying to connect. 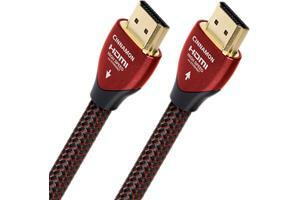 You can read more about choosing quality HDMI cables in the video section of this article. Optical cables transmit audio signals as pulses of light. What it does: An Optical cable transmits digital audio signals as pulses of light. Like coaxial (below), it's surround-sound-capable for up to 5.1 channels of sound, but can't carry the high-resolution audio formats found on Blu-ray discs. On today's equipment, optical connections are more common than coaxial. When to use it: Optical and coaxial digital (below) are your next best choice when HDMI isn't an option. Nearly all HDTVs have an optical jack to send the Dolby Digital audio from over-the-air TV broadcasts to your receiver. You'll also find optical jacks on CD players, cable/satellite boxes, DVD players, and home theater receivers. What to look for: Because they use pulses of light rather than electrical impulses to transmit audio signals, optical cables are virtually impervious to interference. However, it's still important to look for a well-made cable. A quality fiber-optic element can reduce "jitter" — subtle changes in the timing of digital signals that can harm sound quality. 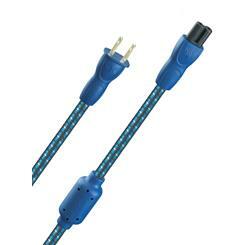 Higher-quality cables also usually feature solidly built connectors for added durability. 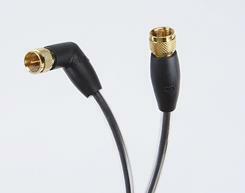 Coaxial digital cables are also surround-sound-capable, delivering up to 5.1-channels of audio. What it does: Coaxial digital cables resemble standard analog RCA cables; however, you should avoid using a standard audio interconnect to transfer a coaxial digital signal. Cables engineered specifically to pass a digital signal usually provide roughly 75-ohm impedance, and wider frequency bandwidth, ensuring superior signal transfer. Like optical (above), it's also surround-sound-capable, but can only deliver 5.1 channels of audio. 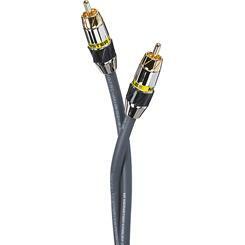 Sound quality from coaxial and optical cables is roughly the same although many audiophiles prefer coaxial to connect high-performance components. When to use it: Coaxial digital and optical (above) are your next best choices when HDMI isn't an option. Although coaxial isn't as common as optical these days, it's still a great way to get surround sound signals to your receiver from your DVD player, cable box, and other components. What to look for: When you're looking at specifications, be sure the cable has 75-ohm impedance. You should also look for copper braid, rather than aluminum, since it's more conductive and can provide better performance. This is the type of audio connection that most people are familiar with. Usually you'll see the simple red and white two-channel stereo connection, though some components also offer XLR and multi-channel analog connections. 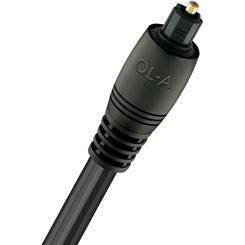 XLR cables are mostly used with high-performance audio gear where excellent sound quality is a must. What it does: XLR is a connection primarily used with professional audio gear that requires "balanced" audio. The connector has three pins — one for the positive conductor, one for the negative conductor, and one for the ground wire or shield. When an amplifier receives the signals from an XLR cable, it's able to compare the signal coming from each conductor and reject any differences that it detects, which indicate noise. XLR is thus less susceptible to external noise sources and better for applications that require exceptional sound quality over long runs. 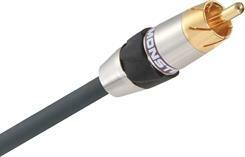 XLR connections are mainly used for analog audio, but there are also digital XLR cables available. When to use it: Use it to connect high-performance home audio gear, such as compatible preamps and power amplifiers that both take XLR connectors. It's also commonly found on professional audio gear, especially with microphones that require "phantom power" — an electric charge runs through the ground wire and can power the mic's internal pre-amps. What to look for: Look for properly insulated conductors to keep the separate signals from interfering, along with good shielding to keep outside noise from affecting the signals. Copper center conductors and gold- or silver-plated conductors will provide the best possible signal transfer. Multi-channel analog audio cables are a great solution for transferring high-resolution Blu-ray sound when an HDMI connection isn't available. 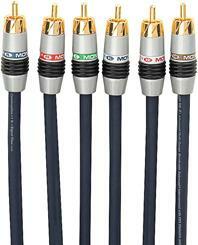 What it does: Multi-channel analog audio cables use six to eight stereo RCA cables to transfer five to seven full-range channels and one low-frequency channel of audio. When to use it: If you don't have an HDMI-capable receiver, this may be your only option for high-resolution Blu-ray surround sound. This setup uses the player's internal surround sound decoder and outputs the signal as analog to a compatible home theater receiver. You can find more information about connecting your Blu-ray player in our article on connecting a Blu-ray player. Multi-channel outputs can also be found on DVD players. What to look for: For good sound quality, look for copper center conductors, double or triple shielding, and high-pressure, gold plated RCA connectors. You might recognize two-channel audio cables by the familiar red and white connectors. What it does: The most basic audio connection, two-channel analog audio cables transfer the two channels of stereo audio. 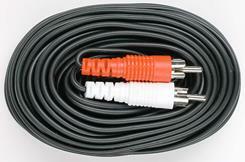 The cable typically found in the box with audio components is generally made with low-cost materials: two unshielded cables bound together, with red and white RCA plugs at each end. When to use it: This is the most common type of cable to make a stereo audio connection between components. What to look for: Look for copper center conductors, double or triple shielding, and high-pressure, gold plated RCA connectors. Because of their higher frequencies, video signals are more susceptible to degradation than audio signals, particularly while traveling through a substandard conductor. And, as with audio, radio frequency and electromagnetic interference can taint the signal. This can cause lines, snow, and other artifacts to appear on your TV screen. A higher-quality cable with a copper conductor and double or even triple shielding can effectively preserve the strength and accuracy of the original signal. A digital video connection will give you the best picture quality when you're hooking up a high-quality digital source, like a high-def gaming system or Blu-ray player, to your HDTV. Digital cables are, in general, a good choice since they're less affected by environmental noise sources than analog video connections. Nevertheless, it's still important to use higher-quality cables, since using poorer-quality digital cables — especially with lengths greater than 3 meters — can result in dropouts and pixelation. Today, your main digital video connection option is an HDMI cable. 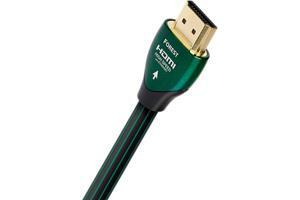 HDMI cables are able to carry high-def digital video signals up to 1080p. What it does: HDMI (High-Definition Multimedia Interface) cables permit the video signal to remain in digital form all the way to the screen, so you avoid the slight picture degradation that can come with translating the signal from digital to analog and back again. HDMI cables can carry standard-definition and high-definition digital video signals up to 1080p resolution, depending on the capabilities of the source component. An HDMI connection is also the only cable that can pass upconverted signals from your Blu-ray or DVD player at 720p, 1080i, or 1080p. And of course HDMI is the only digital video interconnect that can carry up to eight channels of high resolution audio. Just be aware that the HDMI standard continues to evolve — you'll want to check out your component's owner's manual to see which features it'll actually support. 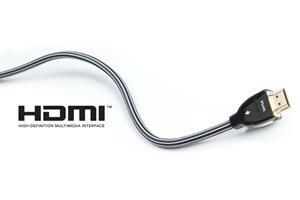 For more information on what HDMI can do, check out our article about HDMI. When to use it: HDMI is the video connection of choice, so use it whenever you can. You can find it on HDTVs, most newer home theater receivers, video game consoles, HD cable and satellite boxes, and even new HD cameras and camcorders. HDMI cables are also backwards-compatible with the older digital video connection: DVI. You can use an HDMI-to-DVI adapter to connect an older component with a DVI terminal to a newer one with an HDMI terminal, but be aware that DVI is video-only — you won't be able to take advantage of HDMI's audio capabilities. What to look for: When you're shopping for an HDMI cable, look for higher-quality metals for better signal transfer, and shielding that will reject interference. If you're especially interested in getting the best sound quality, you might want to look for an HDMI cable with silver-plated conductors, though bear in mind that silver is only about 5% more conductive than copper. If you're trying to find a connection for an older TV or receiver and HDMI isn't an option, then try to use one of the analog video connections below, starting with the topmost. Component video cables are the only analog video cables capable of carrying a high-def signal, making it a good backup if HDMI isn't available. What it does: Component video connections deliver better detail and color accuracy than you get with RF, composite, or S-video by splitting the video signal into three parts, with each part transmitted via its own cable. Unlike the other three types of analog connections, component video is capable of passing high-definition and progressive-scan video signals up to 1080p (although it's common for video equipment to limit the resolution of the output via component video connections to 1080i). When to use it: Since it's also high-def capable, it's a good "plan B" when HDMI isn't an option. It's found on most DVD players, Blu-ray players, HDTVs, HDTV tuners, high-def cable and satelltie TV boxes, and A/V receivers. Just be aware that not all video components can send, and not all HDTVs can receive, a full 1080p signal via component. What to look for: High-quality, gold-plated connectors that provide a secure fit are important. Also look for cables that use copper center conductors and double- or even triple-shielding to preserve the video signal. S-video cables are useful when hooking up older gear, like S-VHS VCRs. What it does: S-video cables feature round, 4-pin connectors, and transmit the chrominance (color) and luminance (brightness) portions of a video signal along different paths. As a result, they provide better color accuracy and detail than either RF or composite connections. S-Video can transfer video resolutions up to 480i. When to use it: It's great for connecting older gear, like an S-VHS VCR or an old TV that doesn't offer a higher-quality connection. Because of its limited resolution compared to newer connections, it's found on fewer and fewer receivers and TVs. What to look for: Look for a cable that uses quality copper conductors and double-shielding to ensure proper signal transfer. Composite video cables should be one of the last types of connections that you consider using — really only when no higher-quality connection is available. 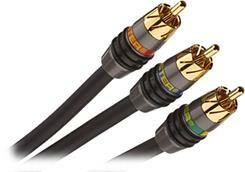 What it does: Composite video cables, also known as RCA, often have yellow video connectors grouped with corresponding red and white stereo audio connectors. It can transmit video resolutions up to 480i. When to use it: It's the type of cable most often found in the box with video components, but it should only be used with VCRs, older TVs, and other gear when there's no other higher-quality option. What to look for: Look for a cable with quality RCA-type connectors, and double-shielding if you want to be sure you're getting the best possible signal transfer. Coaxial RF cables should only be used when sending a TV antenna, cable TV, or satellite signal to your A/V system from outside. What it does: Coaxial RF, also known as F-type, was designed to carry video and stereo audio information from a TV antenna or cable TV jack. Keep in mind that it should only be used to carry signals into your A/V system from outside your house. When used to send signals between components, it's the lowest quality video connection and can only transmit video resolutions up to about 350i. When to use it: It's used for connecting antennas, cable boxes, or satellite dishes (not to be confused with coaxial digital audio cable, above). What to look for: Standard coaxial cable is stamped "RG-59." Look for higher-quality "RG-6" cable, which features lower signal loss and better shielding, both of which are essential for DBS satellite systems and longer cable runs. And if you're installing the cable in your wall or underground, make sure it's properly rated for either application and that it has weather-proof connectors, if you need them. Because video game consoles don't generally use standard audio/video connections, you'll need a gaming cable to connect it to your gear. Gaming consoles: We recommend using an HDMI cable with the Playstation® 3 or Xbox 360™ if you want to get the best high-def picture. It'll also be your only option if you want to watch Blu-ray movies on the PS3 at the highest resolution, 1080p. If your TV doesn't have an HDMI input, or if you're working with a console that doesn't have HDMI, you'll need to get a special game cable that's compatible with the console's proprietary video output. You should still choose the highest-quality connection your TV can accept, preferably component video. 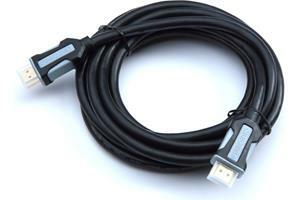 Camcorders: Most camcorders simply use a mini-USB-to-USB cable to transfer video footage to your computer and an A/V cable to connect your camcorder to your TV, and come with these cables in the box. But if you have a newer camcorder that records footage in high-definition, then you'll probably want a mini-HDMI-to-HDMI cable in order to watch your footage on your HDTV. A lot of newer digital cameras also have the ability to record a few minutes of HD video, and also require a mini-HDMI-to-HDMI cable for playback on your HDTV. Replacement power cords can give you subtle sound and picture improvements. Power cables: You generally won't have to think about replacing the power cords on your gear, but sometimes they can break down after years of wear. You might also consider replacing the power cords in your system if you're a real audio/videophile — high-end power cables provide cleaner, purer power, which can mean subtle picture and sound improvements. As with any cable you're replacing, look for good shielding that'll protect the electrical current from interference. For a better idea of what to expect, read what one of our A/V writers, Dave, has to say about his experience with new power cords. Follow these general rules of thumb to get the best results from your cables. Safety first — make sure your equipment is turned off before connecting any new cables. 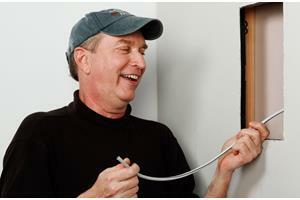 Because they can introduce interference into the signal, try to keep power cords a few inches away from signal cords. If this isn't possible, at least try to minimize contact between the two by crossing them at 90° angles when they do intersect. If an interconnect has arrows printed on its jacket, hook it up so that the arrow is pointing away from the signal source, and toward the destination. In these types of cables, the shield is grounded only on the end that connects to the audio or video source, so that interference will drain away from the destination end of the cable. 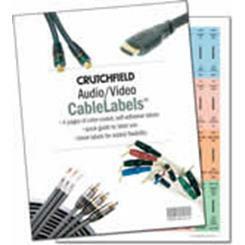 Our self-adhesive, color-coded labels keep your audio, video, speaker, and power cables clearly identified. Don't keep excess cable lying in loops. Arrange it in an "S" shape or a figure-eight instead; this can help minimize electromagnetic interference. Check your connections every year or so to make sure they're not loose. You'll also want to look for corrosion around metal plugs, especially if you're using a low-quality cable. Check out our list of frequently asked questions for tips on how to keep your cables and connections clean. Label your cables so that you know which cables go where in case you have to move your system, and to make troubleshooting easier. For more tips on how to manage your cables, check out our tips and techniques for home audio/video cable management. I was hoping to see some technical information on RCA Coaxial cable for a powered subwoofer. There seems to be a difference in the manufacture's specifications. It would seem to be the cable of choice to use in other analog audio connections. I'm a little confused on HDMI cable cost. If the cable is carrying a digital signal, which is basically a combination of 0's & 1's, what kind of signal degradation could you get? I'm converting some analog videos to digital via a camcorder. The camcorder has two choices for output: either a single audio/video plug, or the red/yellow/white plugs. Both of these output cables have red/yellow/white on the other end. Assuming the cables are of equal quality (I don't know if that's true), is there a difference in output quality? Thanks. You have two different types of connections, I'm afraid. Your older component has stereo audio outputs (red and white for the right and left channels), plus a composite video output (yellow). On the other hand, your TV's inputs are for video information only. One input is for image brightness and other two are for color difference signals. Those red, blue and green cables are known as YPbPr cables.